One of the hardest working wedding and function bands in Scotland, Grand Central have caused quite a stir since taking the Glasgow Wedding Band scene by storm a few short years ago. With their reputation for performing fresh chart hits and fantastic versions of some great dance floor rock and pop classics, it's no wonder this band is in demand. Grand Central are versatile - have a look at their set list for example - talented and professional in their approach. They look good, sound great and deliver a great night's entertainment every time. Rock, pop, ceilidh, funk, the latest chart hits and tried and tested dance floor fillers - they're all there. Steven from the band said "We were keen to appoint Hireaband as our agents because of their reputation for being organised and for caring about the bands they represent and the clients who use their booking and consultancy service. The busier a band is, the more they need the services of Hireaband to organise and support them. This allows us to get on with the job of entertaining our audience. We only work with the best equipment and have set very high standards for ourselves. It makes sense to appoint an agent with the same approach." Get an instant quote and availability check right now or why not add Grand Central to your shortlist of favourites? Probably by now you've had a listen and heard why they make such an impact when performing at weddings in Glasgow. If you are looking for a band to hire that are also happy to travel, you've definitely come to the right place. Grand Central are booking fast. Move fast or risk missing out on one of the best bands Scotland has to offer. Get an instant quote and online availability check on your screen right now. Fill in the quick enquiry form and bingo! I highly recommend Grand Central and the team at Hireaband. From our initial enquiries right through to the booking of our band, Hireaband were on hand to answer any questions we had. I was very skeptical about having a band at my wedding so it took us ages to pick the right one. We needed a perfect mix to suit all ages. Also my dad is a major music fan so I knew the band had to impress! We spent nights on lots of websites listening to bands but as soon as we heard the vocalist for Grand Central we just knew. What was also awesome was the band allowed us to include our own playlist in the middle of their set. This allowed us to have the perfect mix of band songs and our favourite music/dance/Oasis tracks etc. The guys were super professional and special shoutout to Jimmy for putting up with my MANY questions on the run up! Top guys, top night and everyone loved it. Just book them! Thanks again guys! Grand Central we’re excellent on the night and had the dance floor full. Extremely friendly and played the songs I requested. Everything was perfect and what we had asked for. Our first dance song and 2nd song were played perfectly. Also, our final song requests were played as planned, no reminders needed. Furthermore, when asked if I could throw my bouquet they obliged and got the ‘single ladies’ on the dance floor. We have received lots of positive comments from our guests about the band. Grand central were fantastic, they made our wedding. Each and everyone of my guest ( all 150 of them) took the time to tell me how fantastic the guys were, i cant thank them enough and i would 100 percent recommend them to anyone that wants to have a great wedding/party. Thanks again guys we wouldn't think twice for hiring you again for any other parties in the future.You made our reception the best! Grand Central were fantastic! Dance floor was filled all night and everyone loved the range of different songs the guys played. We were due to have a short ceilidh played but given the dance floor was so full this didn't happen. The guys knew what to play to keep the audience entertained. We would recommend them to anyone else thinking of them! Great service from Hireaband too. From the first contact and throughout this was a five star booking experience. On the night the band were brilliant, we had great feedback and hope to re-book for next year. Many thanks. The band were really excellent, arrived early and sought us out to speak to us about exactly what we wanted. The whole experience with the band and Hireaband was very good. The only concern was that we had not heard form the band until around 6 weeks before the wedding, but this was less of an issue than I had thought. Overall very good and I would recommend both Grand Central and Hireaband. Fantastic band, really played to the wedding party, a brilliant night! Grand Central are an amazing band! Lovely guys! Everything was perfect!! All of our guests are still talking about how amazing they were! Hire a band were so simple to book, pay & they answered any questions, we were always kept up to date! Fantastic band, fantastic company, would recommend to everyone and will definitely bare in mind for our next event! 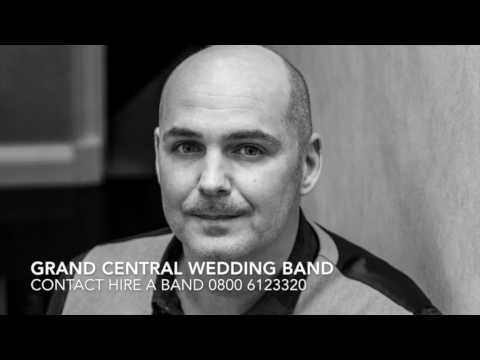 Hire A Band were really helpful in helping us book Grand Central for our wedding. This band is simply fantastic. They played a wide variation of music which suited everyone. I would highly recommend them for any occasion. They have given us a wonderful happy memory. Thank you. I'd just like to say thank you so much to Grand Central for playing at our wedding. They were fantastic and had a great set list! We have had various comments on how good the band were as they aren't very local to us so nobody had heard of them. They definitely left a great impression and had the dance floor filled all night. They were also very accommodating and allowed my husband to use their drum kit when himself and a couple of guys from his pipe band asked to play a few tunes. We can't thank them enough for helping us celebrate our wedding reception. Grand Central, were absolutely amazing and in our opinion put the icing on the cake for our wedding. The play list was excellent and the quality was even better. I would highly recommend them to anyone, best band I've ever heard/seen at a wedding. We booked the band Grand Central through Hireaband Scotland based in West Kilbride. The Hireaband team were fantastic at helping accommodate us listening to the band prior to us booking. As we are local to the office we actually stopped in to visit the ladies involved and found their setup to be incredibly professional while still personal. The band were super professional and we have lost count of the great comments we have received about them. They were so friendly and got back to us really quickly with the answers to any questions we had in the run up to our big day. They played all the songs we requested and had the dance floor full. Our first dance song we requested wasn't on their set list but they were more than happy to learn it for us. Their sound was fantastic and was tailored to fit our venue and guests. You should book these guys for any function as they will do you proud, we can't thank them enough. All our best and thank you all. Big thank you to Hire a Band for recommending the Grand Central guys to us. They were absolutely fantastic. We really can't recommend them highly enough! All of our wedding guests have commented on how good they were and they were all very impressed with there amazing set list. Grand Central were absolutely amazing! The dance floor was full from the get go and our guests were so impressed with the band. It became quite a talking point. Thank you so so much for making our wedding reception the most wonderful evening. Our day certainly finished with the most almighty bang! You completely surpassed our expectations and it was great to meet you all. I can keep this very short, absolutely fantastic from start to finish. Many commented on Grand Central being the best Wedding Band they'd ever seen. The lads themselves couldn't have done more to keep the dance floor full and they were extremely accommodating for all our requests. 10 out of 10. Grand Central were fantastic, had everyone up dancing, good range of tracks to suit all ages. Would recommend them to anyone looking to hire a band. Prior to booking Grand Central we went to watch them preform a gig in Stirling. We knew then that they were the band we wanted to preform at our wedding. Ian and I would like to say a huge thank you to grand central for all of their hard work on the lead up to our wedding and on the evening of our wedding too. We absolutely loved hearing them preform as did all of our family and friends. They made our wedding reception so personal and special to us, preforming all of our requests. They really were amazing and exactly what we had wished for. We can't wait to relive the evening when we receive our wedding dvd. They were a pleasure to work with prior to the wedding. They took on board all of our requests and contacted us regularly to make sure that all of our song requests were met. We absolutely loved every minute of grand central preform as did all of our friends and family, who have asked us who our band were since our wedding. The dance floor was packed all night and they had such a good mixture of classic and modern songs that kept all of the guest happy and played to the crowd. Thank you again to grand central for helping to make our day so special, it really was the best day of our lives. We hired Grand Central and they were absolutely fantastic. All our guests commented on how good they were. They were all professional and courteous from the moment we met them at the wedding band showcase. I had various requests re the playlist etc and they were more than accommodating. I would definitely recommend both Hireaband and Grand Central. Great band and great service. The big day was brilliant and Grand Central were awesome! Before and after the wedding I've heard nothing but good things regarding them. My wife, myself and guests thought they were excellent!! Everyone commented after the wedding how amazing the band were. Thank you very much Grand Central for making our wedding reception extra special. You really are amazing. If we are ever in need of a band again we would 100% be in contact with yourselves. Thanks again. Laura and Jamie. Band were superb and went down well with everyone present. The music they played suited all age groups and they played at a volume which was acceptable to dancing and conversation. Would strongly recommend. David and the guys were amazing on Sunday at our wedding. Their mix of songs had the dance floor full all night long. My 4 year old niece was even dancing during the buffet to the background music the guys played through their sound system. Special thanks to David and one of the guitar players for an amazing version of Bryan Adams I will always be right there. Our first dance song that they learned from scratch in about 5 weeks. Amazing band and lots of positive feedback from our guests. Well done guys. Grand Central were amazing at our wedding, the dance floor was busy all night, the guys were really friendly and all my guests loved them! So glad I went through Hireaband. After two bands cancelling on us with 12 weeks till our wedding I wanted someone reliable and that's what they are, they won't let you down! Lisa Cotton was so friendly and helpful every time I phoned. She gave me a list of bands that would be appropriate for what we wanted and so glad I listened to her advice as Grand Central were better than the previous bands we originally had! Thank you again guys for an amazing service. Grand Central were amazing! They performed a huge variety of songs and the dance floor was full from start to finish. Really nice guys and excellent performers!! The crowd loved them and we are so glad we chose them to be part of our special day! A good band makes a good night and Grand Central were excellent and everybody has raved about them since the party. A great variety of good music. Just wanted to say thank you for all your help. The band sounded great and really made the night. Would love to have them back again. Grand Central were excellent and were a joy to listen and dance to during our wedding reception. They did a brilliant job at playing our selected first dance song and had a great selection of music which they played very well throughout the night. I would definitely recommend them to anyone looking for a good band for their wedding. Grand Central were absolutely superb! Numerous guests commented on the quality of the performance from the band! We originally saw this band play at a gig in Stirling and booked them after seeing them there - and we didn't regret our choice! The lead vocalist in particular has a very versatile voice and could perform a wide variety of song genres. All members of the band were friendly and approachable - they even allowed one of our guests to perform a song for us! We would like to thank Grand Central for being an amazing band at our wedding! We would highly recommend them to others! Hi guys. Just a message to thank you all from the bottom of our hearts for playing at our wedding. You guys really went above and beyond to make our reception a night that us and our guests will remember for many a year to come. Variety of music was outstanding and had everyone from the kids to the grandparents dancing all night. Speaking of the kids you may have 4 up and coming groupies lol. Hope to catch you guys again soon. Thank you again. Grand Central were fantastic as our wedding band. They were very friendly and accommodated a last minute change in our fast dance, which was much appreciated. The dance floor was busy all night and several of our guests commented how much they had enjoyed the band and one of our friends asked for their details for her wedding. A really fantastic night with a fantastic band! Grand central were excellent at our venue and all of guests commented on how good they were. We will be recommending the band to other bride and grooms to be for sure. We had chosen 3 songs prior to the band starting and they were very accommodating with this. Thanks for a great night :)- I would recommend Grand Central and Hire a Band as the service from you both was first class. Absolutely fantastic service. Would highly recommend. Grand Central are a credit to yourselves. They were FANTASTIC! !